From primary care to subspecialty pediatrics, you find the most advanced, comprehensive and coordinated care for your child at USA Health. Children have a unique set of health care needs. We understand this at USA Health, where the pediatricians and pediatric subspecialists that your child may need are all conveniently located on the first floor of the Strada Patient Care Center. Our dedication to your child's care continues at USA Children's & Women's Hospital, where our mission is to make you and your child as comfortable as possible in the healing environment. Our pediatric doctors provide an exceptional level of care due in part to the coordination between pediatricians and subspecialists such as pediatric surgeons, pediatric cardiologists, pediatric endocrinologists and others. This coordination is possible because these physicians are all part of the same system—USA Health. We have the largest pediatric subspecialty group in the region. As an academic medical center, our providers stay on top of the most current trends in pediatric care and treatment, and they continuously educate and train new pediatricians and pediatric subspecialists. As a result, USA Health is transforming medicine for children and families on the Gulf Coast and beyond. If your child has a health care need, USA Health offers pediatric care in the following areas. The Hollis J. Wiseman Neonatal Intensive Care Unit (NICU) is a special part of Children's & Women's Hospital that provides critical care to newborns. As the only treatment facility of its kind in the area, the Pediatric Intensive Care Unit at Children's & Women's Hospital provides the highest level of care for critically ill and injured children. At a time when they’re undergoing changes that lead to adulthood, adolescents can receive care from an understanding specialist for attention deficit hyperactivity disorder (ADHD), gynecological health, acne and more. Parents of children who show signs of developmental delays, autism, cerebral palsy and other conditions turn to USA Health specialists, who can provide answers and effective treatments. 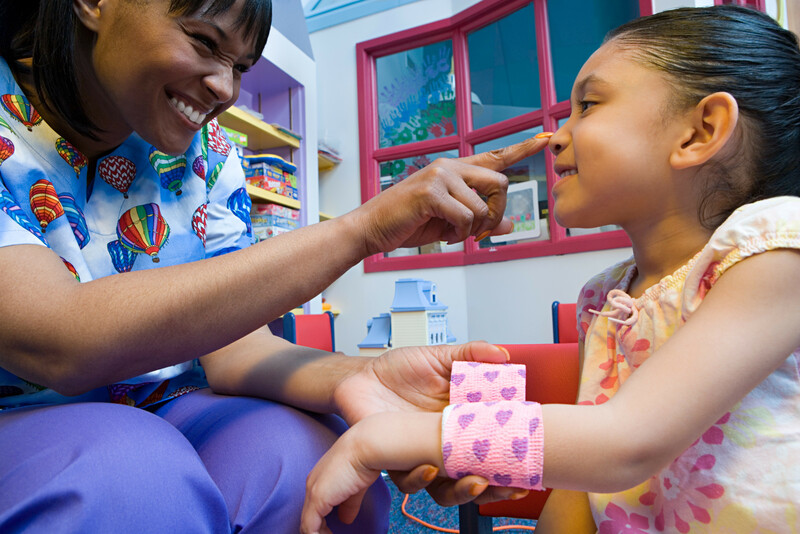 Only USA Health offers specialized care for children through our emergency department. Specialists work hand in hand with traumatologists to ensure that our youngest patients receive the emergency care they need. When hormone-producing glands don’t function properly, it can create numerous issues for children. Fortunately, pediatric endocrinologists at USA Health have extensive experience treating children with conditions of the thyroid, pituitary gland and adrenal gland, including Type 1 and Type 2 diabetes. At USA Health, a diverse team of pediatric specialists focuses on children with obesity and/or lipid disorders. We work with families to help patients make changes that help prevent cardiovascular disease and diabetes and that help ensure their well-being. USA Health physicians who are board-certified in pediatric hematology and oncology work with young patients and their families to diagnosis and treat this blood disorder so that children can experience a normal childhood and healthy life. When a child is diagnosed with any type of cancer, USA Heath hematologists and oncologists offer their expertise to provide the most advanced care and hope to families. When your child experiences a heart or vascular condition, our pediatric cardiologists provide an exceptional level of expertise and care. Our pediatric gastroenterologists are trained to deal with issues of the esophagus, stomach, liver, intestines and more relating to the special needs of children. Our pediatric infectious disease specialists provide an accurate diagnosis and a comprehensive treatment plan to give each child the best chance for a positive outcome. Our pediatric nephrologists draw from a wealth of resources to care for children who are experiencing problems with their kidneys. USA Health offers comprehensive care from a team of neurologists and neurosurgeons who can diagnose and address brain and nervous system disorders in children, including congenital conditions, epilepsy or other issues. Our pediatric orthopaedic surgeons are uniquely qualified to address injuries and conditions of the bones and joints in children, and provide care plans and treatment options specifically for their young patients. The only hospital of its kind on the Gulf Coast and one of only a few free-standing in the country, we are dedicated to the unique needs of women and children. Located at Children’s & Women’s Hospital, the NICU cares for premature and sick newborns. Pediatric critical care is available from USA Health specialists in the PICU at Children’s & Women’s. Emergency medical services for children are provided through our 11-bed, Level III emergency department at USA Children's & Women's Hospital. This award-winning treatment center for children with cancer and other critical illnesses is located at Children’s & Women’s Hospital. Sickle cell disease is a specific blood disorder treated by USA Health physicians who are board certified in pediatric hematology and oncology. The Pediatric Sickle Cell Clinic provides consultation for the diagnosis, management and treatment of children with sickle cell disease. Our mission is to improve the lives of persons affected by this disease through clinical care, basic and clinical research, and through patient and professional education. The Pediatric Sickle Cell Clinic is located in the Strada Patient Care Center in Suite 1F. Learn more about our Pediatric Sickle Cell Care. USA Health specialists provide care to adolescents for attention deficit hyperactivity disorder (ADHD), gynecological health, acne and more in a clinic designed especially for them. In this clinic, we treat common adolescent conditions, as well as discuss issues related to sexuality and contraception. The clinic is open Monday through Friday, 8 a.m. to 5 p.m. (closed from noon to 1 p.m.). We treat patients from 12 to 21 years, but some exceptions are made. The Adolescent Medicine clinic is located in the Strada Patient Care Center in Suite 1D. Learn more about our Adolescent Medicine services. Help for a family with an autistic child starts with identifying the condition. USA Health specialists diagnose children with autism spectrum disorder and provide support to families. The mission of this clinic is to improve the lives of children with autism spectrum disorders in the greater Gulf Coast area through early identification and diagnosis, as well as to provide educational outreach to families, physicians, day care centers, churches and other organizations that serve children in the community. Autism spectrum disorder is characterized by impairment in social interaction and restricted/repetitive behavior. The Autism Diagnostic Clinic is located in the Strada Patient Care Center in Suite 1F. Learn More about USA's Regional Autism Network and the services it entails. Any hospital stay can cause stress for both the child and the family. That’s why USA Health Children's & Women’s Hospital developed the Mapp Child and Family Life program (named for hospital patrons Louis and Melinda Mapp). Through this program our specialists, therapists and teachers help patients, siblings and parents cope with stress and minimize the disruption of a hospital stay. Our children's hospital displays a welcoming child-friendly environment throughout. For example, the TreeHouse is an activity room where young children can forget about being in a hospital and do what they naturally love to do—play. But we don't stop with playtime. Through ClassAct, credentialed teachers from the Mobile County Public School System provide children with instruction in hospital classrooms or at the bedside, if needed, while they are hospitalized. For children and families who are able to go outside the hospital or who are visiting a provider at the Strada Patient Care Center, the Geri Moulton Children’s Park is a playful, serene space for strolling about, taking in the fresh air and admiring the beautiful sculptures. Set among the winding entryway to Children’s & Women’s Hospital, the park is designed to inspire hope and support the healing process. USA Health is concerned about every facet of a child’s well-being. So when a child visits a USA Health pediatrician’s office for a wellness visit, starting in their first year of life they receive a free, age-appropriate book. At USA Health, we have an array of physicians specially trained to care for the unique needs of children. As an academic medical center, USA Health offers leading-edge treatment options to children and their families.